Went shopping for doggie fashions this afternoon, and as tempting and all as it was to buy a black puffer jacket emblazoned with "Stud", we settled on a nice sedate tartan number. 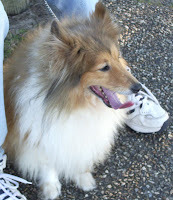 The red Sheltie has developed a rash and is going to be shorne, so of course he has to be kept warm, poor wee thing, he will miss all that fur and so will we, this dog has been shorne before and believe me its not a pretty sight. After the shopping and to recover from the sticker shock of doggie fashions, we went for a nice late afternoon stroll along the Maroochy River. As you can see, some rests were needed. 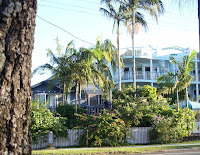 Would just love to holiday in this lovely old house or even in one of the front units of the block next door, cocktails on the veranda at sunset.........heavenly. One of the many old fishing shacks at the end of the private jetties along the waters edge, with the late afternoon sun magnified through the round glass windows. 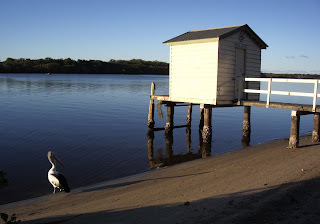 The Darling snapped this pic of another jetty and shack, complete with Pelican and late afternoon shadows. This one he took looking back towards the setting sun, love the play of light and shadow on the water.